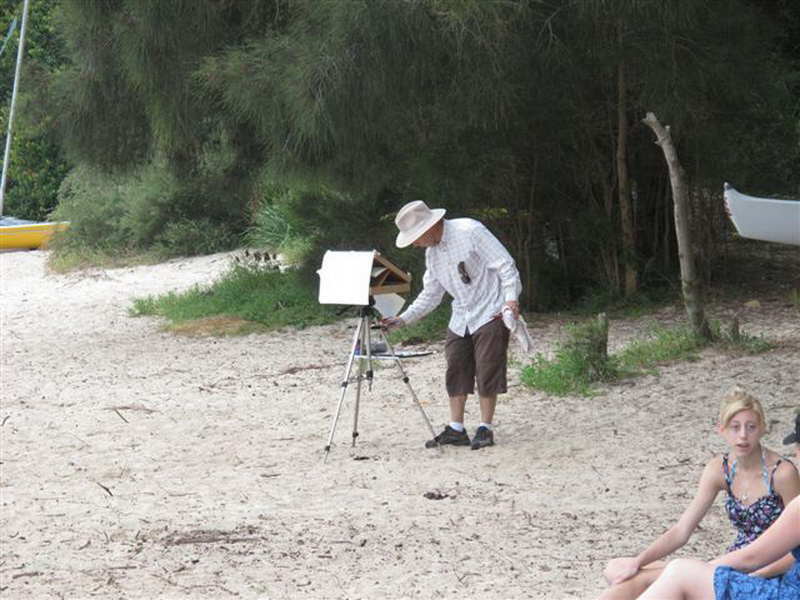 From time to time I wondered about the weight and functionality of my plein air painting easel. It took too long to set up and was heavy. This got me thinking about just what is important in an outdoor watercolor easel and how I could reduce the weight so that carrying it around is not a chore. As I like to paint on quarter sheet paper, and because I prefer to paint standing up, a tripod easel is a necessity. So I set about producing a lightweight plein air painting easel. Something that could be made with a minimum of materials but would still be very functional for my type of plein aire painting. This article gives all the details of my setup in case anyone would like to produce a similar easel for their own use. Because of its length I have divided this article into two parts. The first talks about my old setup and what was wrong with it along with what I feel is needed in a good plein air painting easel for watercolor painting. My old gear consisted of a wooden box easel used for oil painting which rested on a tripod. The box stored my pallet and even some spare paper along with a couple of trays that were attached to the tripod and on which I rested my pallet, water container and brushes. It worked well however it was not something you could easily carry while travelling abroad. An additional problem with the old setup, apart from the weight (3.7 kg / 8.16 lb) was that I had to lean over the bottom tray to get to my painting surface. In time this was putting more strain on my back than I wanted. Figures 1 and 2 are of my old setup. As you can see I also used to paint on a watercolor block which meant carrying a lot more weight than I needed. Because of the weight of the box on top it required a stronger and heavier tripod. It was also a bit awkward to fix to the tripod. Figure 2: The problem with the original easel was I had to lean over too much, and the palette was too low. I decided to see just what was really essential when I went out plein air painting and to discard the rest. It had to be as light as possible while being sturdy enough to support my paper and palette without undue motion. Everything had to be at a comfortable working height once I started my watercolor painting. The palette should be close to the height of my watercolor paper so it could be accessed very easily. The water container had to be convenient as well. I required something to hold my brushes, and spray bottle, while painting without them rolling away and falling onto the ground. The easel should be able to be set up very quickly with a minimum of parts that could go missing if they fell onto grass i.e. not too many extra nuts and bolts. The mixing areas in my palette had to hold plenty of watercolor paint. 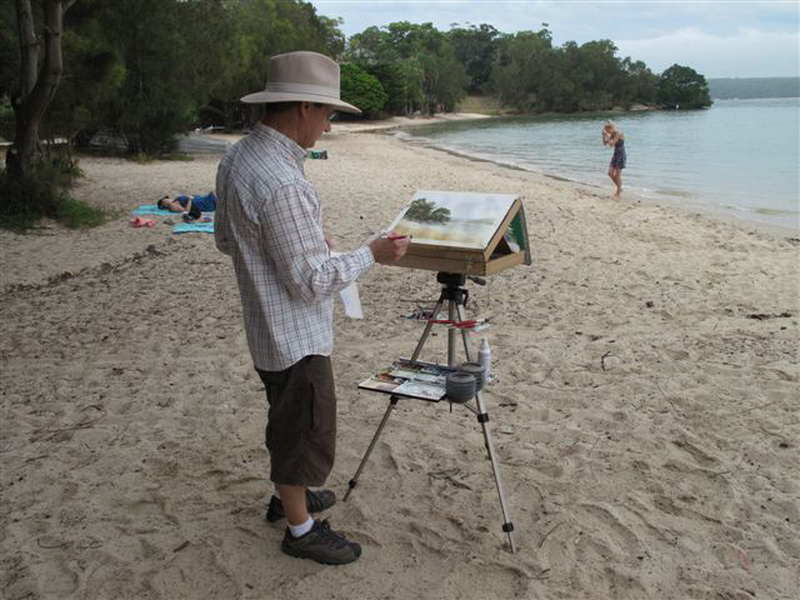 Continue to part two by clicking this link: my current plein air painting easel. The new and improved light weight watercolor plein air easel is the most ingenious invention I have seen yet for watercolor painters. I have been searching for a while for a travel easel that is light weight, easy to pack, affordable, has easy access to palette and water, and actually works . Thank you for sharing this idea. I plan to make one as soon as I can assemble the parts. Glad you found the design useful Susie. Good luck with making your own.